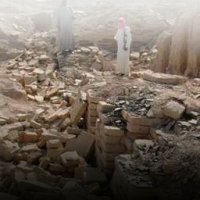 Experts have been unable to assess damage to historic treasures in Mali, Syria caused by rebellions which have added to cultural chaos left by Arab uprisings. Experts have been unable to assess damage to historic treasures in Mali and Syria caused by rebellions which have added to cultural chaos left by the Arab uprisings, a top UNESCO official said. The situation is "very, very worrying" in the Mali city of Timbuktu, a UN heritage site, where Islamist fighters said to be linked to Al-Qaeda have already destroyed the tomb of a Muslim saint, said UNESCO assistant director general Francesco Bandarin. Experts from the UN Educational, Scientific and Cultural Organization (UNESCO) held talks in Bamako on Friday with the junta that seized power in Mali on March 22, before Tuareg rebels and Islamist allies took over the north of the country. Fighters from Al-Qaeda in the Islamic Maghreb have been accused of destroying the tomb of St Sidi Amar after taking over Timbuktu in late March. Fifteen other holy tombs and 300,000 Muslim manuscripts are now at risk in Timbuktu and the nearby city of Gao, experts said. UNESCO has had no direct contact with the rebels and cannot enter Timbuktu, Bandarin said. The treasures are "extremely vulnerable," said the expert. "We are afraid of pillages." For the moment, the toll is difficult to estimate, however. It is also hoping to send a team of experts to Syria where there are heritage sites such as the Krak des Chevaliers and Salah Ed-Din Crusader castles and the Roman city of Palmyra. "In terms of protecting heritage, so far we have not had major damage but a lot of sites have been used for military operations like Palmyra," said Bandarin. UNESCO has raised an international alert among countries that signed a 1954 convention on protecting cultural treasures. It also works with Interpol and major art houses. For the moment no major increase in illegal art trafficking from Mali or Syria has been noticed but Bandarin said it normally takes several months for objects to filter through to the market. The UNESCO official estimated trafficking in cultural objects to be a six billion dollar a year industry. The Arab uprisings have been a major challenge for UNESCO, where it is still trying to estimate losses and damage in Yemen, Libya and Egypt. Cairo has seen a major increase in the construction of illegal housing since last year's uprising against Hosni Mubarak, said Bandarin. "In protecting heritage, very often the post-conflict period is the worst period," he said. "After conflict the states are very weak."